One of the biggest challenges when looking for an SUV with third row seating that seats 6 passengers is finding one that has a comfortable and accessible third row. In many models, getting to the third row is a task best left to children, as it involves squeezing behind a large second row bench seat that doesn’t fold forward nearly enough to make reaching the back row easy. Manufacturers of midsize SUVs have recognized this and have started offering an optional captain’s chair configuration for the second row to provide comfortable seating for 6 adult passengers. With two separate chairs instead of a bench seat, it’s possible for passengers to walk down the middle of the vehicle to reach the back. It also allows you and to fasten a child’s seat to a second row chair and still be able to get to the back. To help you find the stand outs in this limited category, here is our list of the five best 6 passenger SUVs of 2017. Undergoing a significant overhaul for 2017, the Hyundai Santa Fe is a well-rounded SUV for anyone looking to buy an affordable family crossover. When configured with second-row captain’s chairs the Santa Fe will comfortably seat six, though the third row is not ideal for larger adults on long trips. Its powered by a peppy 290-hp 3.3L V-6 paired with a 6-speed automatic gearbox. It’s a far cry from a sports car, but it’s more than adequate for daily driving. The Santa Fe comes equipped to tow up to 5000 pounds., and that’s competitive with other vehicles in its class, some of which may need additional options to provide towing. Both FWD and AWD are offered on all trims, and it’s hard to go wrong with either choice. While they both provide a comfy ride for the Santa Fe’s passengers, definitely opt for the AWD option if rough road conditions are a concern. The FWD powertrain gets a respectable 21 mpg, placing it right in the middle of the pack for fuel efficiency. On the inside it’s fairly well equipped even in the base models without any optional extras, featuring a rear-view camera, steering wheel mounted controls, and a 7.0-inch touchscreen display. To top it all off, the Santa Fe is an IIHS Top Safety Pick+. The Acura MDX continues to be a top performer in luxury style SUVs for 2017. 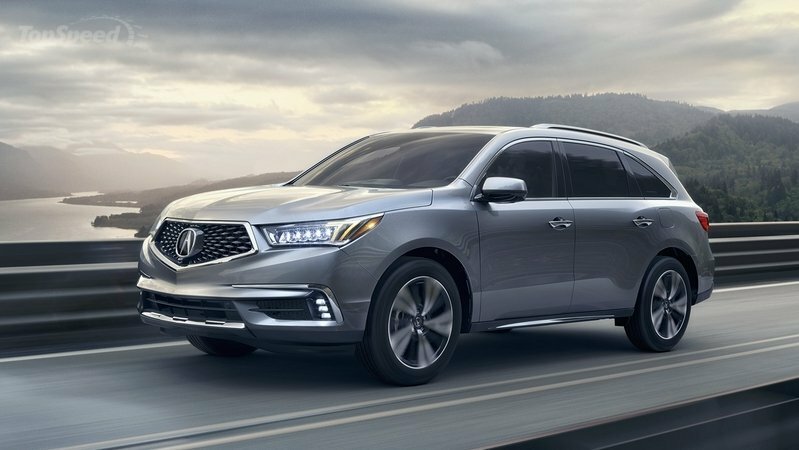 Acura has made minor tweaks to the MDX’s handling to provide a more consistent and comfortable ride, and they’ve added a hybrid model to the lineup .As an added bonus, more active safety features, like the AcuraWatch safety software, come as standard on MDX models,. Most MDX buyers will opt for the base model engine, a throaty 3.5L V-6 with 290-hp paired with the increasingly common 9-speed automatic gearbox. The 9-speed still isn’t a perfect option, but it’s better than the initial wave of 9-speed’s and does get the job done in most situations. While both FWD and AWD are available, with FWD being the standard, the AWD powertrain is the clear choice. Acura has made significant tweaks to the already very good AWD system that was in the 2016 MDX, and it would be a shame to pass it up on the 2017 model. The MDX doesn’t disappoint in the luxury comfort department either. The captain’s chairs in the second row are just as comfortable as the seats in the front, with plenty of horizontal and vertical room. The third row is actually usable by adults, but can be difficult to access even in the captain’s chair configuration. There are pockets and charging ports scattered throughout the MDX, as well as 3-zone climate control as standard. Given that it’s essentially the same chassis as 2016, it’s no surprise that the MDX is once again an IIHS Top Safety Pick+. 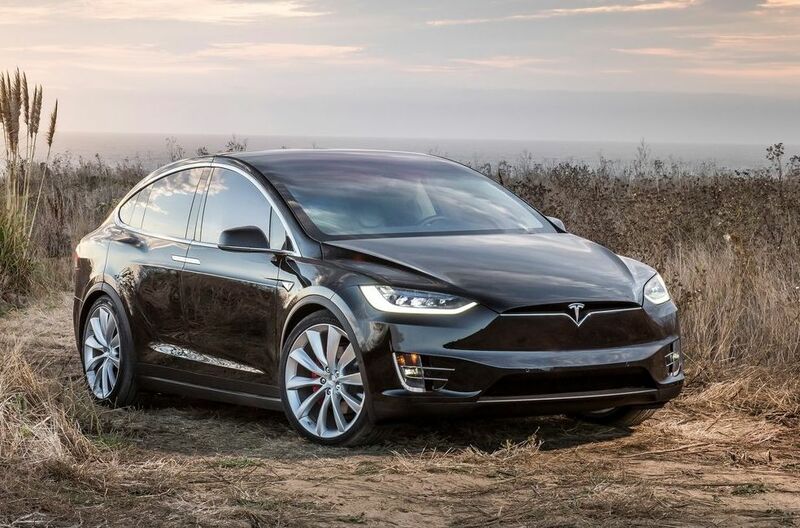 Just released last year, Tesla’s Model X made waves in the auto industry as a practical, albeit expensive, electric crossover. Let’s get the bad news out of the way first: there’s very limited room in the third row, and seating in the back should be reserved for children. That’s not surprising given the Model X’s small profile, but the third row will fold flat for additional cargo-space. The falcon-wing doors, while not as impractical as what can be found on space-age hypercars, can cause issues and amount to a “love it or hate it” design choice. Lastly, all this fancy tech comes with a hefty price tag, and a fully optioned Tesla X in its highest trim will run over $100,000. That being said, the first seats and second row are some of the most comfortable accommodations found in any vehicle on the market today, and the Model X is one of the most advanced consumer automobiles available. Just looking at the safety features list alone highlights this point, with all the tech-y buzzwords present. Front-mounted radar, blind-spot/lane-departure warnings, automatic emergency braking, and a 360 degree sonar system to work in conjunction with the X’s autopilot feature. Twelve airbags keep the X’s occupants safe in the event of a collision. This dizzying list of features is all controlled with a massive center-mounted 17.0-inch touchscreen display. SUV manufacturers, take notes here on speed. The Model X is faster than most supercars in its highest trim, boasting a mind-boggling 0-60 time of 2.8 seconds. This is credited to Tesla’s powerful electric motor and tech filled AWD system, giving the Tesla full power throughout the entirety of its power-band. More impressively, all that power is provided with a 237-mile range, making the Tesla X one of the longest range pure electric consumer vehicles ever, and it shouldn’t be surprising to anyone that the X handles like a dream and is a joy to drive. 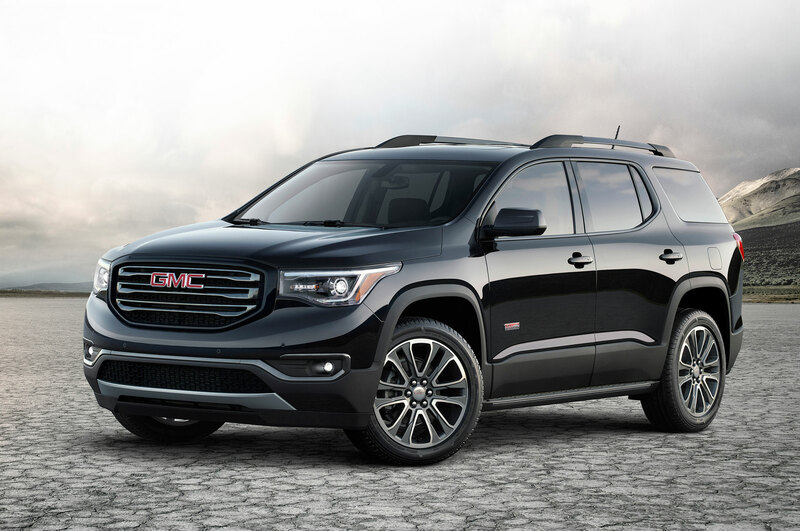 Losing a hefty amount of weight and shrinking in size, GMC has presented a more modern Acadia for 2017, placing its focus on a family-friendly people carrier with a touch of luxury. The interior has been tweaked to provide a much more upscale feel over last year, with lots of soft surfaces and a pleasing aesthetic. The Acadia really does feel like a much more expensive SUV than it actually is. Equipped with a standard 2.5L 4-cylinder engine that does its job reasonably well, the Acadia isn’t going to win any speed awards. Overall the engine is a bit underwhelming, but GMC can get away with a less powerful motor thanks to shedding over half a ton off the Acadia’s curb weight. The better option is the 310-hp V-6, which gives the Acadia a welcome boost over the 4-cylinder, particularly when under load. The Acadia almost handles like a car and has a very comfortable ride. There’s an abundance of room in the 2017 model despite being shorter than last year, and the third row can be usable by adults on short trips. It’s also an IIHS Top Safety Pick. The Ford Explorer is popular in the U.S., and it’s easy to see why. 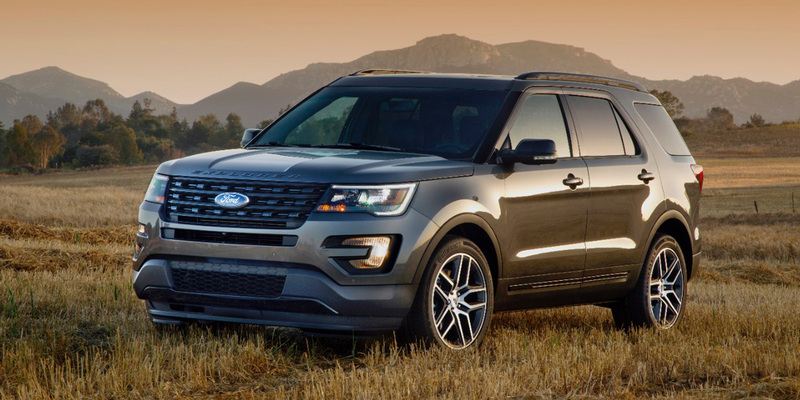 After going through a number of iterations over the years, the newest Ford Explorer’s are perfect examples of what a mid-range family SUV should be, featuring practical design and comfort. Equipped with a 290-hp 3.5L V-6 paired with a 6-speed automatic transmission, even in the base model the Ford Explorer doesn’t lack power. However, as is the new trend in Ford’s SUVs, a turbocharged 2.3L 4-cylinder is also available, and just like last year’s model, for 2017 this is the better option. Not only does it have better throttle response, it get’s better gas mileage too, at 22 combined mpg. The turbocharged 4-cylinder is standard on AWD Limited trims. Inside, the Explorer features a 4.2-inch display, cruise-control, bluetooth, and steering wheel controls as standard. The driving dynamics of the Explorer are largely unchanged from 2016, resulting in the same benign handling characteristics of last year’s model. That’s not necessarily a bad thing, and the Explorer is very comfortable to drive with plenty of room for people or cargo. The third row seat is more practical than some SUV’s offerings, but still isn’t suitable for adults on long trips. 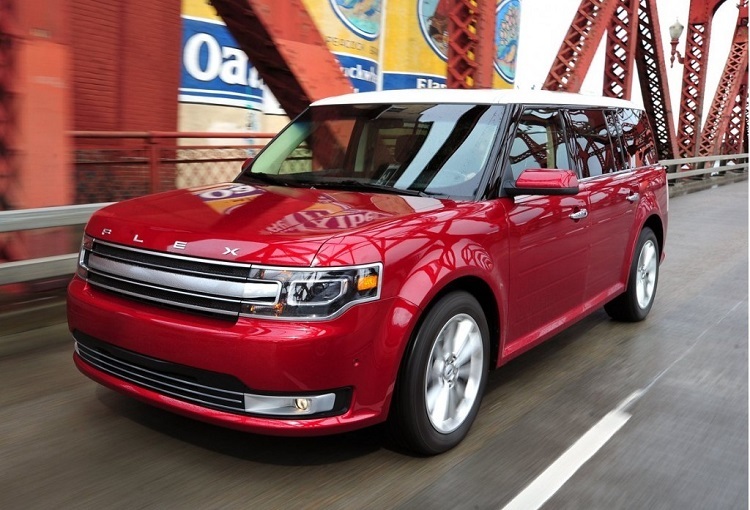 The Ford Flex is a smartly blended mix between Van and SUV. It’s entirely unapologetic about it’s boxy looks and excels at its intended purpose as a versatile people carrier. Easily one of the most spacious SUVs in its class, the Flex will comfortably seat six without issues, and it leaves room to spare for cargo. The third row can be stowed for additional hauling capacity, and while the interior isn’t overly luxurious, it seats its passengers in practical comfort for long drives. Ford offers two powertrains on the 2017 Flex, continued from last year. The base model is a 3.5L V-6 making 288-hpP. There is also a turbocharged V-6 rated for 365-hp available exclusively on AWD models. Both engines are paired with a 6-speed automatic gearbox. Neither option is bad, though the turbocharged V-6 is noticeably faster in every way. The major talking point for the 2017 Flex is the addition of Ford’s Sync-3 infotainment system as standard. This is a much-needed improvement over the old system found in the 2016 Flex. It’s the only significant change found in the 2017 Flex, but a welcome one. The Dodge Durango works nicely as a tough vehicle that can double as a family-friendly SUV. Dodge has once again tweaked the Durango’s exterior for 2017, and while the styling is not aging well, there’s a lot to like on the inside, like the cavernous cargo-space and strong engine options. 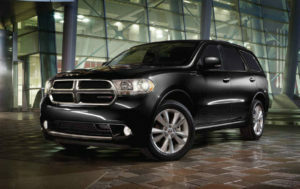 The standard 3.6L V-6 makes 290-hp and allows the Durango to pull an impressive 6200lbs. It doesn’t feel light on power even when heavily loaded, and gives the Durango a moderate amount of zip when unladen. Dodge also offers an optional V-8, and for drivers set on hauling, the V-8 will up the towing capacity to 7400lbs. That’s a similar towing capacity to much larger (and more expensive) SUVs like the Chevrolet Tahoe. The Durango comes with RWD as standard, with an optional AWD system. There is a massive amount of cargo space in the Durango, even with six passengers, and the third row will fold down to create even more room. Passengers seated in the third row will find it has a fair amount of leg and head room, and with the second row captain’s chairs, the Durango will easily seat six even on lengthy trips. Its handling has been improved as well, making it feel like a much smaller SUV than it actually is while on the road. 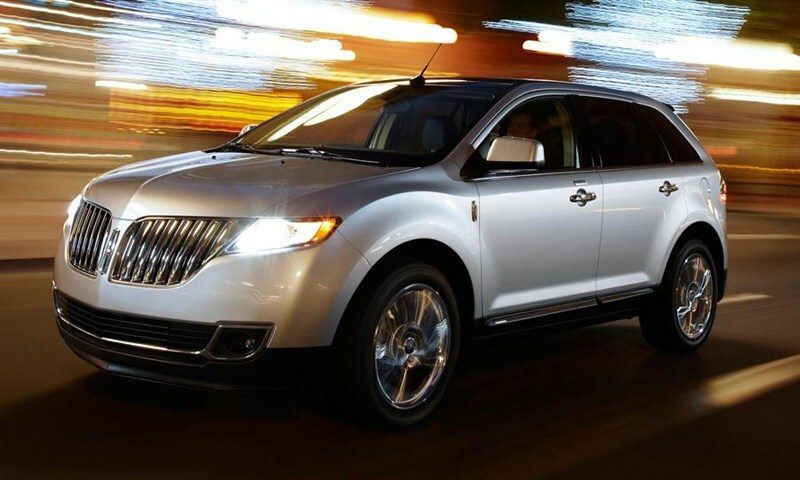 Well-equipped even in the base model, the Lincoln MKT is a practical luxury SUV designed for comfort and class. It won’t haul a huge amount of cargo, having less overall space than its competitors, but it’s almost completely unmatched in terms of comfort. The first two rows of seating are akin to what would be found on a much more expensive European SUV, and while the third row isn’t anything to write home about, it does provide functional seating. Both engine options present in the Lincoln are good, the standard being a 303-hp 3.7L V-6 available only on FWD powertrains. The second is a turbocharged Ecoboost 3.5L V-6, making 365-hp and only present on AWD trims. Both engines are paired to a good 6-speed automatic gearbox. Between the two, the Ecoboost V-6 is the better option, but neither engine leaves the driver feeling a lack of power. The standard features on the Lincoln are a real highlight, with a rear-view camera, six airbags, rear park-assist, and the MyKey system that allows parents to set limits for younger drivers, all accessible via the 8.0 inch touchscreen. It includes the full list of optional safety extras like lane-keep assist, forward collision warnings, adaptive cruise-control, and blind-spot monitoring. Wrapping up the MKT’s luxury people-carrier vibe is its great handling and comfortable ride. It’s a long SUV, but handles like a much smaller vehicle, and the advanced suspension will keep passengers happy even on rough roads. 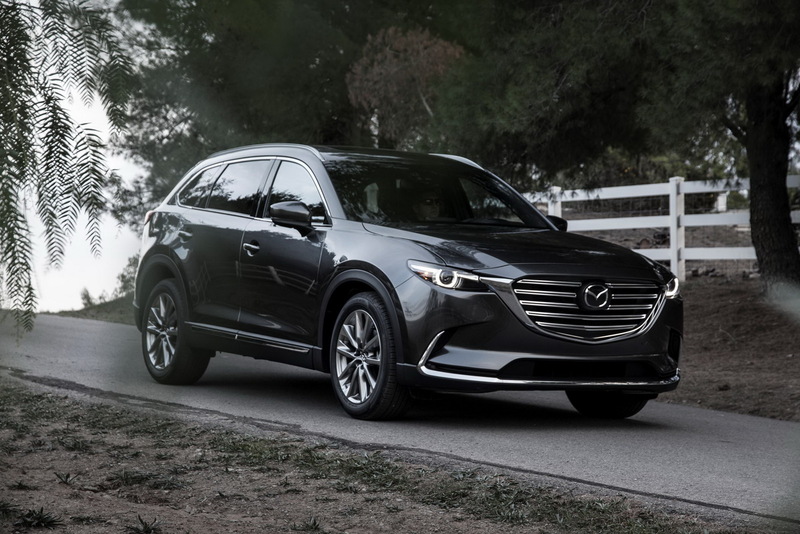 Like all Mazda vehicles, the CX-9 is marketed as a driver’s SUV. It may not be particularly fast, but what it lacks in speed it makes up for in driver enjoyment thanks to its agile handling and responsive feedback from the road. It’s powered by a 2.5L turbocharged 4-cylinder that makes just 250-hp paired with a 6-speed automatic. FWD and AWD options are both available. Again, the engine isn’t all that quick, but it does provide adequate power for its role as a family SUV. Where the CX-9 shines is in its handling. It’s not a Miata, but it’s clearly inspired by the same sporty feel of Mazda’s premiere roadster. Driving in the CX-9 is a tactile experience, the steering wheel providing ample feedback to allow drivers to feel the road they’re on, and it spot-like handling belies the CX-9’s SUV chassis. Driving enthusiasts will feel at home in the CX-9 without needing to shell out the money for a BMW or an Audi. Wrap it all up with an outstanding 24 combined mpg and the CX-9 shouts to be driven all day long. Where the CX-9 stumbles is in interior comfort. The driver and passenger seats are fine, but the second and third rows are lacking in overall comfort and space. The second row isn’t unusable, but more care could have been taken to allow for comfort on long trips, and the third row should be used exclusively for children.